#HEYFACEBOOK Why Won’t You Talk About Catfishing? It’s just another night, and just another email from someone who did a reverse image search on a man she was being courted by online only to discover all his photos belong to a guy named Alan Levine. These victims emphasize their shame at being fooled and seem focused on feeling bad for me as a victim of identity theft. Let me be clear, some lying their who uses images and shreds of info that any 3 year old can Google has not taken one thing from me. My identity is strongly in tact. Please google me. In the last few months I have ebbed and flow in fury, and probably pounded out too many blog posts on this. My 12 minute read on medium is my third most read story (a paltry 1500). I thought when Jonathan Worth helped get a story on this in boingboing something might happen. All I really want to know is what the f*** Facebook is doing on this. What actually do they do when someone reports a false profile? Why can their facial recognition technology easily tag my own photos, but when some fake account is created using the same photos, they just let it slither on in? Any emails I get from Facebook are signed “Facebook”. There is no way to contact them online. They have no phone numbers. I exploited every high level technical connection I had (which are obviously not that high nor well connected). No one has a contact inside of Facebook. No reported I contacted wanted it as a story. There are large numbers of women being ripped off of a lot of money, but worse, having their trust stomped all over. This is a large scale problem AND FACEBOOK WILL NOT SAY POOP ON IT. So failing on all fronts to get facebook’s attention, as am asking you, oh large and powerful internet, to pick up my #HEYFACEBOOK campaign and ask demand an answer. Will you help? Will you take a 3 minute break from liking, statusing, inviting me to &#####ing Candy Crush games (that’s for my cousin) in facebook– and ask them Why Are you Making it Easy for Scammers to Create Fake Accounts Using Other People’s Photos? Since they are rolling in even more money these days, I think Facebook can put some attention on this. To be clear, Facebook made a profit of over $1.5billion in the last three months of 2015; take in the number slowly, and count how many zeroes there are in that number, and ask yourself — do they have any social responsibility to those 1.6 billion users? I do know, I am far from done here. 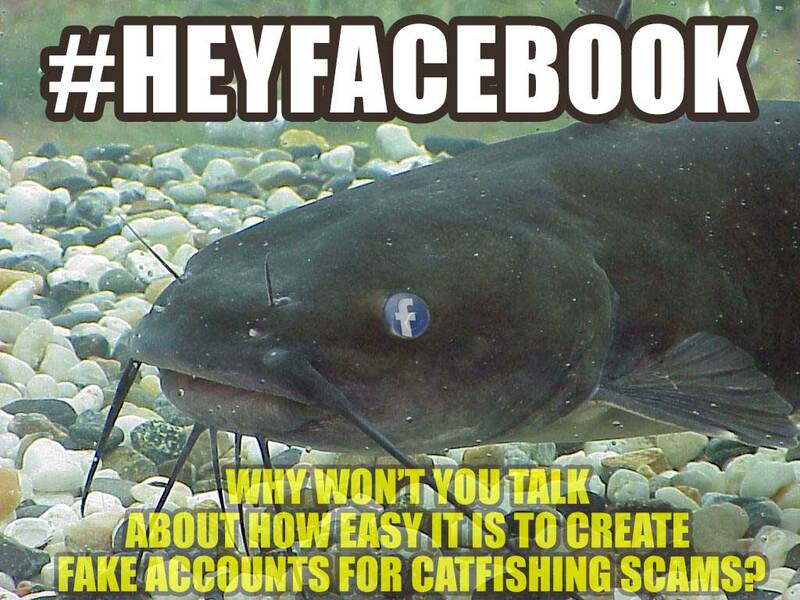 Top / Featured / Memed Image: One of the best Catfish photos I found in Wikimedia Commons, a public domain image of a Channel Catfish, with a Facebook logo PNG for it’s scamming eyeball, and my own F****ing angry words on top. #HEYFACEBOOK CAN YOU HEAR US YET?